Announcing a new series of Guides from Genetic Lifehacks! These Guides are a workbook series on how your diet and genes interact. Arranged by topic, they give you a new way to interact with your genetic data and to take a deeper dive into how your genes make you uniquely YOU. Why a workbook? In this day and age of quick genetic reports that tell you whether you are “red” or “yellow” for a genetic SNP, I decided to create a workbook format that will take the time to really explain what the studies on a genetic variant really show. The emphasis here is on explaining the research. So often I’ve come across articles on the internet that say “If you have X gene you should never eat Y”. But the research behind most of those claims is rarely that straightforward, and often these claims are extrapolated from extremely small studies that have since been disputed. Everything in the Guides is backed up with fully referenced studies — and I encourage you to read through the references. 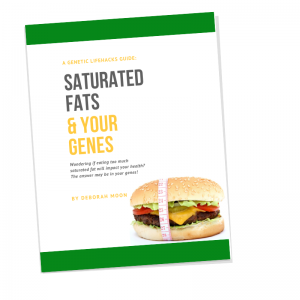 Saturated Fats & Your Genes $6.99! Sleep and Your Genes $7.99! Spring Sale: Use the coupon code SPRING20 during checkout to save 20%! The workbooks are downloadable PDF’s and can be used for your whole family. This is a great way to see how you passed down genes to your kids — or to see how your parents passed along their genes to you. Seeing the information written out really helps to hit home the fact that we really do have different dietary needs, even amongst members of the same family. I have crafted the workbooks to work with either 23andMe data or AncestryDNA.com data, and I’ve included instructions for both. Looking for a sample before you buy? Of course! 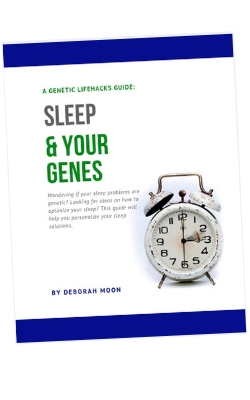 Check out the Sleep & Your Genes sample pages.